Can a keratin treatment be done on any type of hair? Yes. 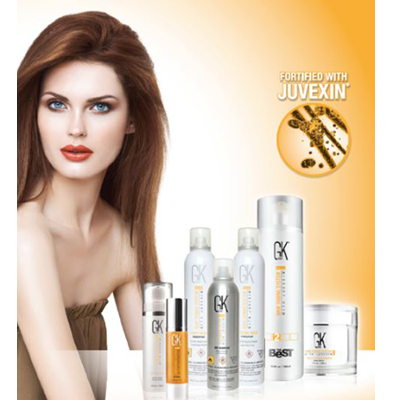 The GK Hair Taming System is effective on any type of hair. Your hair can be coarse and thick or fine and thin and you can still enjoy the results of silky straight hair. Keratin treatments will work on colored-treated, highlighted, relaxed, bleached, permed or virgin hair. You can even apply the formula to hair that has already received another smoothing service. Can I color my hair after a keratin treatment? It is best to color your hair approximately two weeks before receiving a smoothing treatment or wait two weeks after. One of the color specialists at our hair salon can help you choose the perfect hair color. How long do I wait to shampoo my hair after receiving a keratin treatment? We suggest waiting 24 hours. This will allow the keratin to be fully absorbed into the cuticle of your hair to ensure the best results. The stylists at our New Orleans hair salon recommend using specially formulated shampoos and conditioners to make sure that your hair will keep its beautiful smooth and silky texture for as long as possible. We can recommend specific products when you visit our salon. How does the taming system transform hair? The special process will make your hair look shiny and healthier with a keratin rich solution that is absorbed deep into your hair cuticle. Your hair will also feel softer and smoother. Keratin provides a tremendous amount of nutrients for the hair and helps repair hair damage. Global keratin formulas are not chemical straighteners so the amount of straightening will depend upon your hair type and other factors. You may still have a small amount of wave, but the frizz in your hair will be reduced and your hair will be much more manageable and smooth. How long will a keratin treatment last? A keratin treatment can last up to 2-4 months, depending upon how frequently you wash your hair. Eventually your hair will go back to its normal state..
Visit The Retreat Hair Salon for the best keratin treatment in New Orleans!